Let’s see what Adam has to say. Do you like riding in the rain? I sure do!! Adam Butler: “If you could see the smile inside my helmet”. If you ride track days on a regular basis chances are that you will find yourself presented with a rainy day. Some of us really find riding in the rain a fun and rewarding experience while others do not embrace the wet conditions as much. Some riders just don’t want to get wet. Others feel intimidated by the reduced traction available and don’t want to take a spill. I can understand the desire to keep your bike shiny and clean. I prefer to take the chance to get out in the wet and work on my traction management. Riding in the rain presents a great opportunity to hone your smooth riding technique. There are some things that you can do to make your wet time on the track more enjoyable. The number one thing you need is a good frame of mind. If you go out with an open mind and a positive attitude you will have much more fun and success. It’s easy to have a fun, positive attitude in the dry…heck, we all love carving turns on a dry 70 degree day. Having this same outlook in the wet will make your experience much better. There are some gear related things that you can do to help. Some basic rain gear will help you stay dry. I have a basic Frogg Togg two piece outfit that goes over my leathers. The last thing is to make sure your tires are in good shape. Any time you are on the track you need to make sure you have good quality tires. Dedicated rain tires are great but you can have a good time on street tires too. Traction management in the wet all revolves around being smooth. When the conditions are wet there is less traction available. So naturally you will be able to get away with fewer mistakes. I start out slow and easy. I start my ride nice and easy and get a feel for the conditions. Then gradually increase my pace as my comfort level increases. The key is to stay relaxed. For me, that involves keeping a light attitude. I often will chat to myself or sing a little. 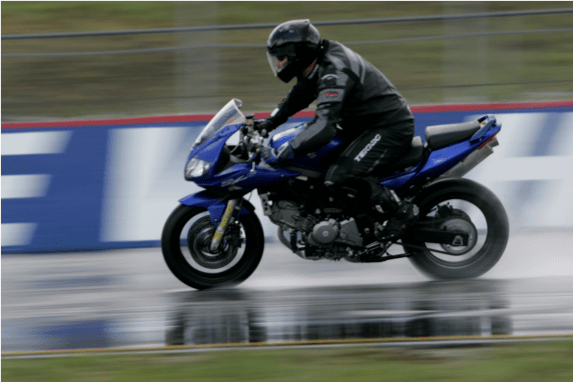 What are your thoughts about riding in the rain, either on the street or on the racetrack? Great read Adam, and great choice for a guest columnist, Ken. I’ve followed Mr. Butler around a wet track, only to find that his smooth riding and comfort in the wet meant he was going as fast on DOT race tires(very minimal water dispersing tread sipes) as I was able to on full specialized rain tires! Riding in the dry only, you might fool yourself into thinking that your basic riding skills are perfectly fine: using your legs and staying light on the bars. 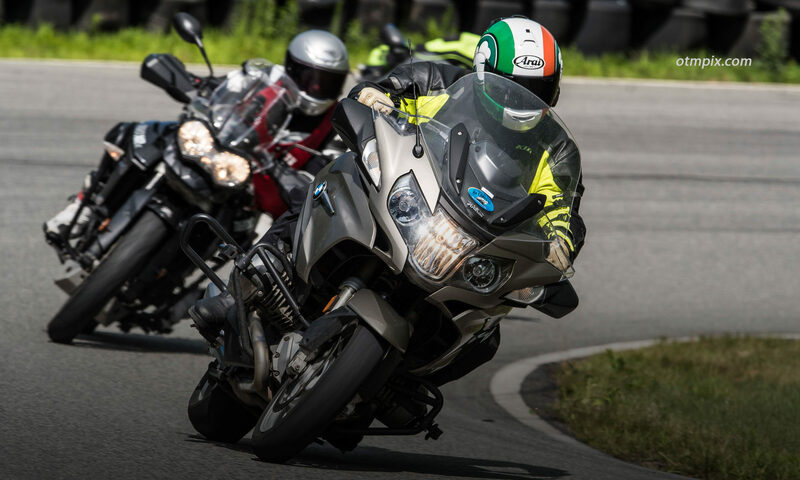 In the wet, the bike is going to “talk back louder” if you are sitting down through bumps, or not letting the front wheel wiggle and find traction through puddles. Great articles! I read all of them. Thanks Adam, Ken. As a new trackday rider, I had an absolute blast on the track in the rain. I feel I learned more about traction management in those wet sessions than I could have ever learned after many dry days. The bike I ride has 3 power modes, A,B, &C C is a wet weather mode with a less abrupt throttle profile and power delivery. I decided to keep it in the A(Performance) mode all the time. I want to be able to practice and have the best throttle control I can, so in the most powerful mode I was able to practice being precise. I did end up feeling some traction loss as I pushed the tires to the traction limit for the conditions. Feeling the back end spinning and sliding out was a nerve-racking experience to say the least. I was trying my hardest to remember all the great advice in the classroom sessions. Hold throttle steady and wait for traction to regain. WooHoo! It worked :-D. Had maybe 3 or 4 times I got to practice this technique. I also had the front lose traction once. I didn’t enjoy that one much, was kind of quick and unsettling. I am not sure what I did to cause or correct that one. Looking back I am really glad for the wet sessions on the track. I feel it gave me valuable training that may of otherwise taken me years to obtain.